UK Release Date - 14th July 2008. US Release Date - 31st July 2008. Format - 12 Inch Picture Disc/Promo CD. Live Track 02 - Recorded 6th June 1993 in Sheffield, England. Special Formats - UK 12 Inch Tour Edition Picture Disc. The second single from 'Songs From The Sparkle Lounge' was released in July 2008. 'C'mon C'mon' was the second single written by Rick Savage to be released following on from 'Goodbye' in 1999. The single was only commercially released in the UK to coincide with the summer 2008 UK arena tour. It was available as a special 12" picture disc. Side One was black with the current Def Leppard pyrite font logo across the middle. Side Two was also black with a smaller version of the logo at the top and the song titles at the bottom, no middle label used. A cardboard insert was included inside the clear plastic sleeve featuring the 2008 UK Tour Dates/song titles in white on one side and was plain black on the reverse. The 12" featured a B-Side of 'Rocket (Live Version)'. This was the full extended version from the Don Valley Stadium show in June 1993. The previously released audio version on the UK Vault Limited CD was an edited version of this. This is the full version as heard on 'Video Archive' that includes the 'Whole Lotta Love' snippet. The song was released to radio in the US and the promo CD included a radio edit of the song. The UK promo came in a slim jewel case with artwork on the front sleeve. Disco ball artwork was printed on the CD. 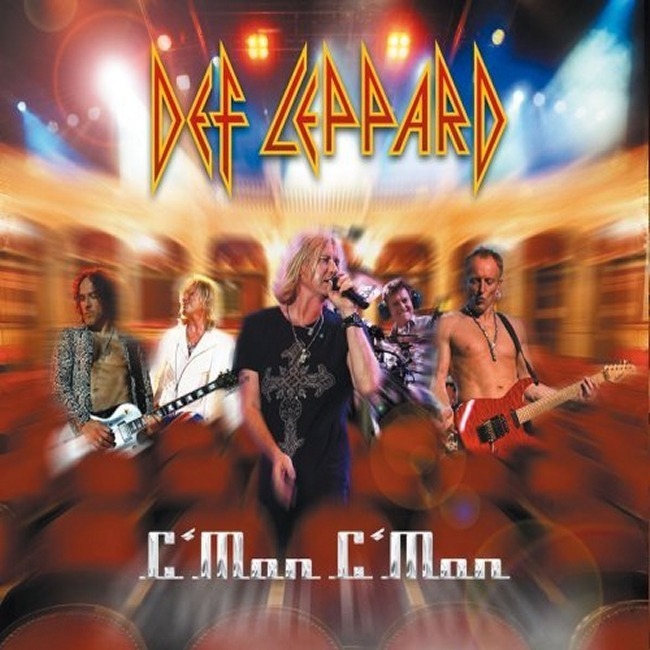 "The legendary Def Leppard release new single C'mon C'mon on July 14th. New album 'Songs From The Sparkle Lounge' has won massive acclaim & entered the UK top 10 and US top 5. In a recent 5/5 live review in Kerrang Magazine editor Paul Brannigan labelled C'mon C'mon a "stadium slayer". With more UK arena dates in July the DL juggernaut shows no signs of slowing down! ".